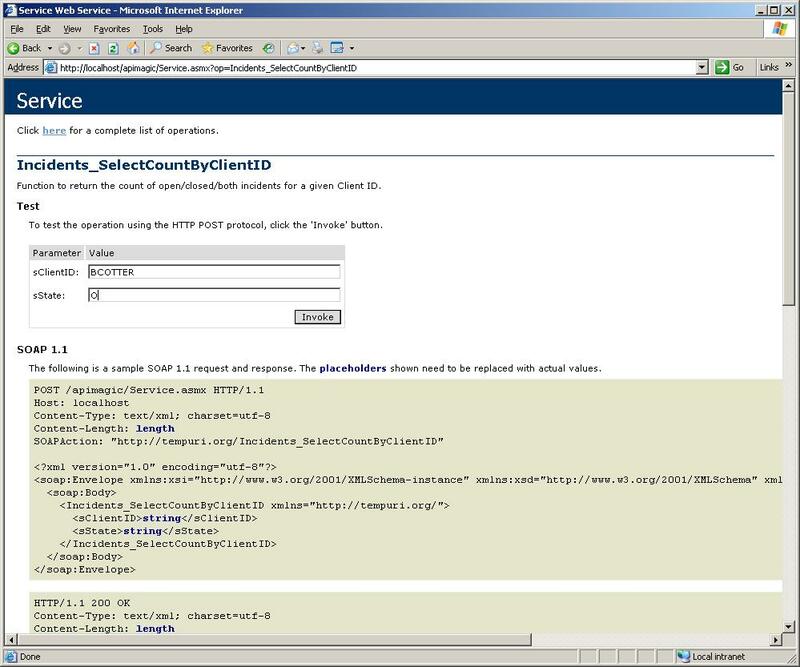 In my first post in this series (Service Desk Express API – Part 1) I discussed the XML Initiator and demonstrated how to build an Integration Engine package that would accept an inbound XML message and raise an incident. 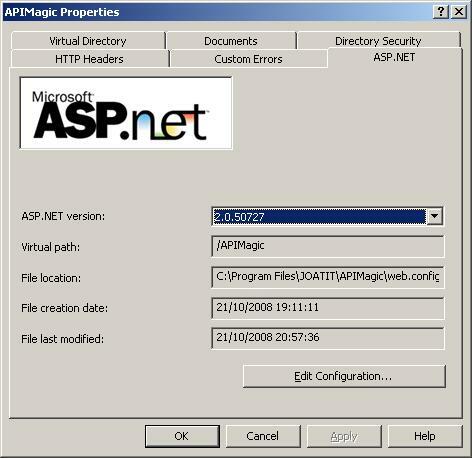 In this post I want to take this a step further and discuss how to build the XML message (in C#) to send to the Integration Engine. To do this I have built a fairly simple web service that will provide our development interface to Service Desk Express, which during this post I will explain how it can be configured to provide any function. You can download the web service here. 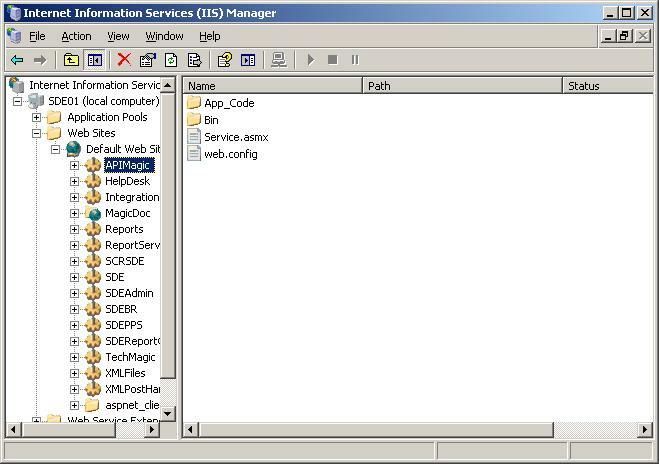 Before we start configuring our functions (or webmethods) that our developers will use we need to configure the web service to talk to Service Desk Express. 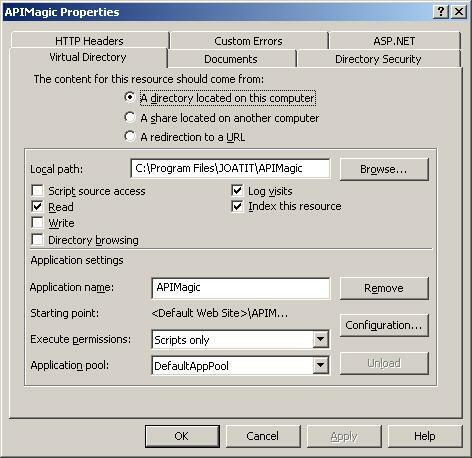 The account shown here APIMagic only needs db_reader permissions to the Service Desk Express database. Before we do however, I wanted to just explain a couple of features of the webservice and how it works. Essentially, the most important thing to realise is that your developers will connect to the Service.asmx file which will in turn provide access to the Service.cs file in the App_Code directory. All of your custom functions will be written in the Service.cs file and this is the only file (other than the web.config file we modified earlier) that you will need to work with. Supporting the Service.cs file is a number of other files (or classes): Data_Access.cs, Utility.cs, and XML_Parameter.cs. You don’t need to worry about these files but you do need to understand the generic functions that are available to you and how to use them. The Data_Access class handles all the “complex” stuff with regards retrieving data from the Service Desk Express database and building our XML documents and sending them to the Integration Engine for parsing. Return_Single_Value: This function will return a single string of data from the database as the result of a Select statement, e.g. SELECT CLIENT FROM _SMDBA_._CUSTOMER_ WHERE SEQUENCE = 1001. PostXML: This function, in conjunction with the XML_Parameter class will allow you to create and send XML messages or posts to the Integration Engine for processing. 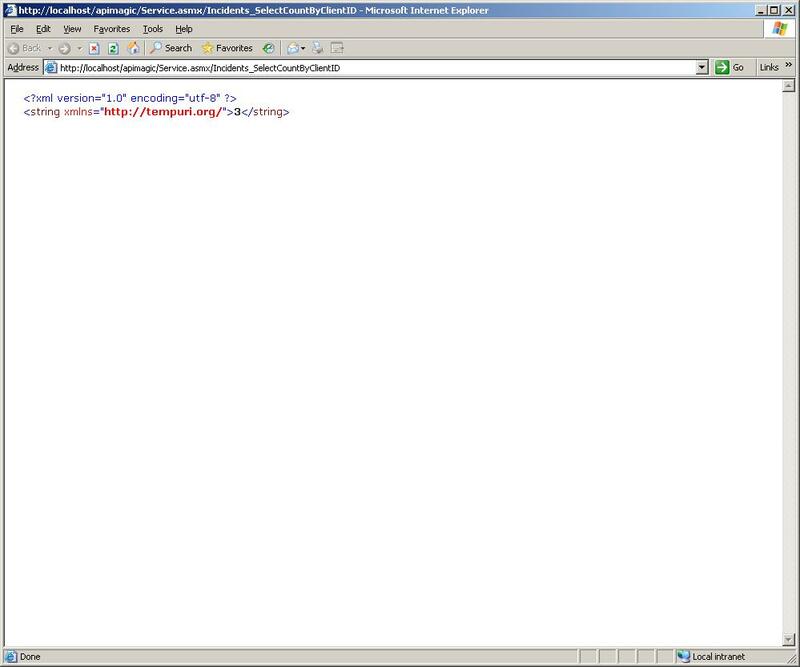 Fundamentally, the XML Initiator in the Integration Engine parses the nodes of the XML document posted to it. The function of the XML_Parameter class is to provide a reusable business object that allows us to define those XML nodes for any given record (e.g. an Incident). The class has three properties: Name, Value, and Parent. To explain these properties lets consider a node from our example XML document shown in the first post in this series. So for each node of our XML document we will instantiate a new instance of the XML_Parameter class and pass in the appropriate values. More on this later so don’t panic. Incidents_SelectCountByClientID: A function that simply returns the number of Open/Closed/Both incidents for a given Client ID. Incidents_SelectByClientID: A function that returns a dataset of incidents for a given Client ID. Incident_InsertUpdate: A function that creates/updates an incident. These three functions are the same three functions that are already coded in the Service.cs file and commented out. The purpose of this function is to demonstrate the Return_Single_Value function described earlier. I doesn’t really matter what the SQL query is as long as it returns a single value. As you can hopefully see, it wouldn’t be that complicated to change the function or create a new one for selecting the number of work orders or purchase requests for a given Client ID. All you need to do is copy and paste the above code and change the _SQL statement. The purpose of this function is to demonstrate the Return_DataSet function described earlier. Again, if we wanted a function to return all Work Orders we would simply copy and paste this function, change it’s name, and change the _SQL string to select from work orders instead. Let’s take a look at how this function works. Essentially all that is happening is that for each variable that is being passed to the function (i.e. sIncidentNo, sClientID etc. ), a new instance of the XML_Parameter class is being instantiated and passed the appropriate values to create an XML node. The parent node is called “request” hence why, at least in my example, all the nodes are being passed the value “request” as their parent value. 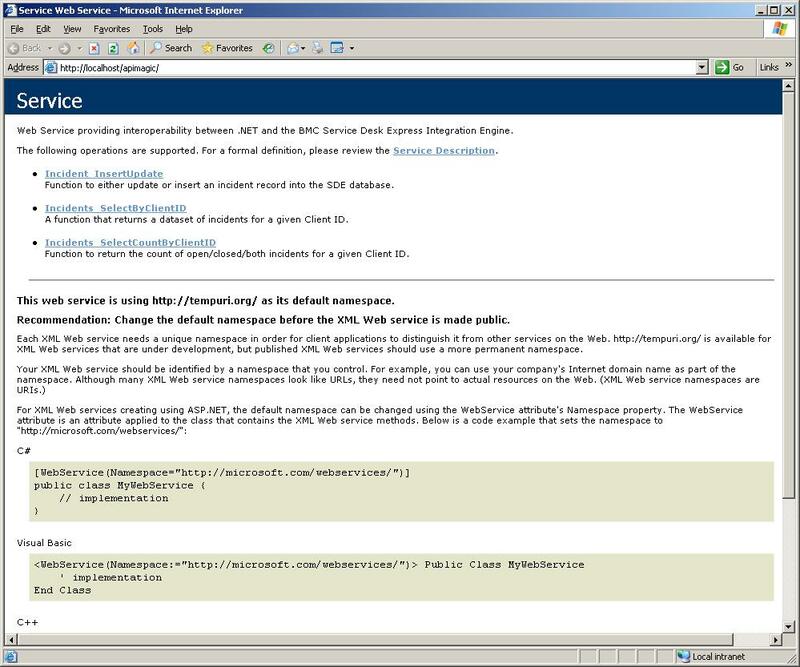 It may not be much at the moment but, simply but copying and pasting the WebMethods and changing a small amount of code (obviously coupled with some appropriate Integration Engine packages) you should be in a position to provide a genuine API to Service Desk Express. The truth is, I have found this post very hard to write as I didn’t quite know what to explain in detail and what to glance over. Between now and when BMC decide to release their new Web Services module for Service Desk Express, I will keep updating this web service with new functions. I would really welcome any feedback a) in general and/or b) specific to this post/project whether positive or negative. I hope this has proved useful.